IT was an emotional moment as Fernando Ricksen presented the fiancée of Rangers bus crash victim Ryan Baird with a mirrored portrait in his honour. Glasgow dad of two Ryan was on the way to the Rangers game against Patrick Thistle in October last year when their Nith Valley Loyal Rangers supporters bus crashed near Kilmarnock. Heartbroken Sarah Hughes who turned up to see Fernando with her friend Billy McLeod from the club, couldn't hold back the tears as she accepted the gift in Ryan's honour and later said: "Everything has just been so overwhelming and the support we've had from everybody has been amazing. I just love the picture and I'll make sure I find a great space for it." Fernando, who has invited Sarah and her family to be guests of honour at his forthcoming charity march in Fleetwood with a team of legends said: "The Nith Valley supporters club have always been there for me and I wanted to give something back. No one expected to go to a football match and not come home." The former Rangers player who suffers from Motor Neurone Disease was joined by his fellow Rangers veterans including Derek Ferguson, John Macdonald and Bob Malcolm as fans launched two special Rangers Legends strips in his honour. 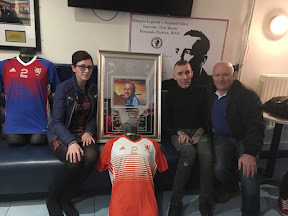 The Ibrox hero was at the Stonefield Tavern in Blantyre for the launch of the two strips which will be sold to raise funds for the Fernando Ricksen Foundation. They will also be used in charity matches like the forthcoming Rangers Legends versus England Select match in Fleetwood's Highbury Stadium on March 25. The two strips - in red and blue - were designed by Fernando himself and feature his national colours. Fernando was in high spirits as he joked with some of his oldest friends and Derek Ferguson paid tribute to him saying he was one of the most colourful characters in football. He said: "They don't make them like Fernando anymore." Bob Malcolm added: "When Fernando first came to Rangers he was Dutch and quiet and then he came out of his shell as he got to know the people. It's great these strips wil be brought out at every game and give Fernando and his charity the recognition they deserve."